If you run a blog or website, chances are that you’ve heard of search engine optimization (or SEO for short). Search engine optimizers are people who tweak websites until they come up on top of major search engines’ search results so that their websites get more traffic. Since they are often addicted to statistics and like to monitor their websites’ rankings daily (at the very least! 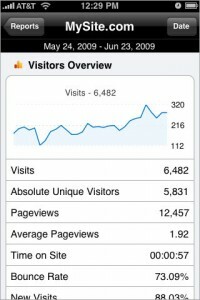 ), DailySEOblog.com lists five iPhone applications to help SEO and I included a bonus one. 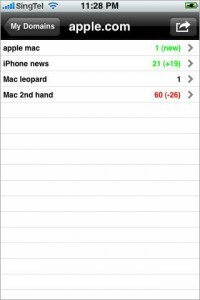 Domain Tracker is a free iPhone app used to track the Google PageRank of a domain and is mostly useful for a quick lookup of a website’s PageRank. 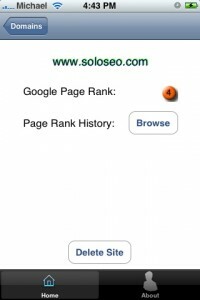 Pokeseo allows you to check your PageRank and the number of backlinks (sites linking to yours). You can send email reports directly from the application. Pokeseo is available from the iPhone Store for $0.99. SEO Search Ranking allows you to easily monitor your websites’ search engine ranking for unlimited amount of keywords and is available from the iPhone Store for $1.99. Analytics App gives you access to your Google Analytics data on the go. It is available for $5.99 from the iPhone Store. proSEO is a SEO content analyzer for iPhone and prepares 14 different analysis of a website’s content. It is available for $9.99. 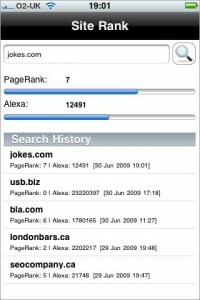 SiteRank is a free iPhone application that allows you to monitor your Google PageRank and Alexa rankings on your iPhone. 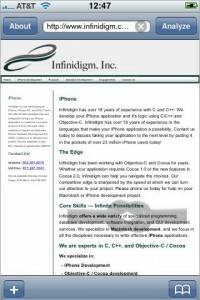 The iPhone is a great platform to develop on and distribute SEO applications at a low price and I hope we see more of them in the future.